DAVID SUCHET HAS very few rules in his career, but last year he discovered a new one. "My agent rang and said, 'You've been asked to guest in a Doctor Who..: I said, 'Say yes!' She replied, 'I haven't told you what the part is or what the episode is about..? I said, 'Just say yes. The rule is, always say yes to Doctor Who!" Suchet recalls watching the very first episode starring William Hartnell back in 1963 - and he remembers, as a teenager, diving behind the sofa during the show's second-ever storyline, which introduced the Daleks. "They were genuinely terrifying," he admits. He was especially delighted to be asked as he knew that Who star Peter Capaldi had signed off on the guest stars. They'd worked together twice before - on Poirot in 1991's Wasps' Nest, with Capaldi playing a psychotic down who turned out to be innocent, and a year later in The Secret Agent with Capaldi playing Russian diplomat Mr Vladimir to Suchet's Verloc. "He's a wonderful actor, very serious and committed - the fact that he should want to work with me, yes please," he enthuses. "And then to be told Mike Bartlett was writing the script... I'm a great fan of his work: Doctor Foster and his plays Chariots of Fire and King Charles HI [Wednesday BBC2]. He made the Landlord, who is ostensibly the villain of the piece, into a real three-dimensional character, when he could have been a Hammer Horror cipher. IN KNOCK KNOCK, the fourth in the current series, Suchet's Landlord offers the Doctor's companion Bill and five of her student friends cheap rooms in a huge house when they're struggling to find somewhere to live. Of course, it's a spooky old place full of creaking wood and with a tower that's out of bounds to all tenants. While this could be a hackneyed horror story, it's instead strangely tragic, in no small part thanks to Suchet and his classical Royal Shakespeare Company training. "It's the reverse of what one normally sees," Suchet explains. "Normally - in Poirot for instance - you see someone you can relate to who becomes the very odd villain. This was the other way around. I play a very disturbed man, incapable of normal conversation, with a weird quality and who touches walls in an unsettling way. But by the end, in spite of everything, the audience will have some empathy for him and realise how vulnerable his heart is. "I've always been attracted to the outsiders;' he says. "All my major roles have been the big outsiders - Iago, Shylock, Caliban with the RSC... I much preferred playing Caliban to Prospero, for instance. Even with Poirot I started from the fact that he was a refugee - who had great fun pointing fingers at the upper classes, but who was also ill-at-ease in his adopted country." It's tempting to look at his family history and draw parallels. Suchet's Jewish Lithuanian grandfather Izidor Suchedowitz's family had moved to South Africa to escape persecution, and David's father Jack moved to London, having changed his name to Suchet in the pre-war climate of anti-Semitism. Suchet's ability to find this human fragility in Hercule Poirot helped make the show such a success running from 1989 to 2013. The first piece of advice he received about the part, however, was - don't do it. "All I knew of Poirot was what I had seen on films; he explains. "My brother John, the newsreader, said don't touch it with a bargepole. He'd been influenced by the hammy film performances. They did try to offer me costumes with a deerstalker and stuff like that, but when I read the books, I saw a different person. I saw how vulnerable he was, so I turned a little to Chaplin although not the walk"
THIS is WHY— despite having almost every role he wanted in his five decades as an actor there's one part that got away. "I wish I'd been given an opportunity to play a very serious interpretation of Napoleon," he reveals wistfully. "He was a Corsican - everyone forgets that. That means he would have been an outsider with a different accent. A small desperate man on a tall white horse who, when he was shouted down, would literally cry on Josephine's shoulder. "It's just like today - if you look at the world today, the bullies are the insecure ones. They don't make the greatest leaders, but they do make the greatest noise. Those are the ones we want to be watchful and careful of" He carefully avoids naming any of those leaders and firmly dodging follow-up questions about 'frump. Next he's playing Salvador Dali in a Sky drama opposite Noel Fielding as Alice Cooper. "Dali is one of the most extreme characters I've ever played - a really odd person with a great talent and unbelievable technique," he explains. "It's a true story about Dali trying to make an Alice Cooper hologram over three days in the Regis Hotel, New York. The results are about as crazy as you'd imagine." In his time at the RSC in the 1970s, Suchet saw many fine Shakespearean actors struggle to transfer to the small screen. It made him determined to learn and to adapt, to keep nimble and open. To that end he still has a drama coach - New York-based Harold Guskin, who's trained Kevin Kline, Glenn Close, Bridget Fonda and James Gandolfini. "I want to keep up with the world. I don't want to rely on, my shtick," he says. "Harold kicks me up the arse and keeps me in trim and real." This is important for a reason - you could see it as the craft, or as an outsider learning how to hide and blend in: "In a business that's usually star-driven, I've had wonderful roles but I've never been a star - I'm a character actor," he explains. "If you watched all the characters back to back, not one of them is the same. 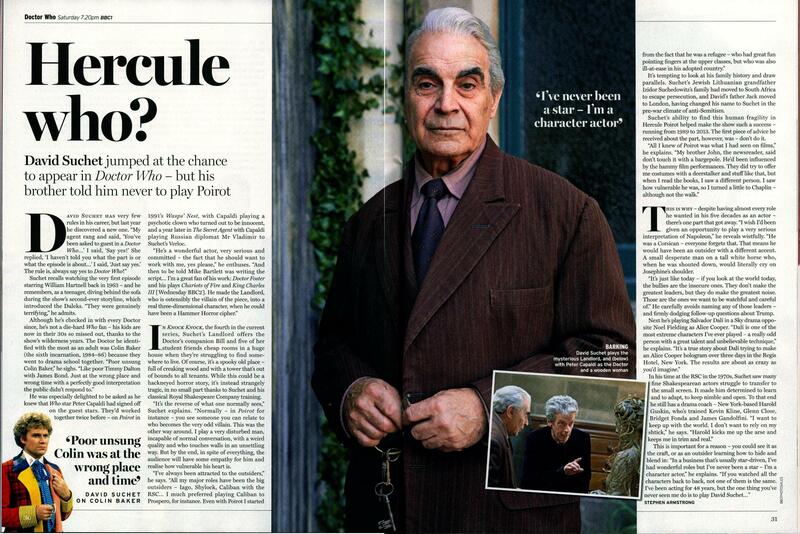 I've been acting for 48 years, but the one thing you've never seen me do is to play David Suchet..."
APA 6th ed. : Armstrong, Stephen (2017-05-06). Hercule who?. Radio Times p. 30. MLA 7th ed. : Armstrong, Stephen. "Hercule who?." Radio Times [add city] 2017-05-06, 30. Print. Turabian: Armstrong, Stephen. "Hercule who?." Radio Times, 2017-05-06, section, 30 edition. This page was last modified on 25 December 2018, at 16:49.